The situation in Mozambique is devastating. 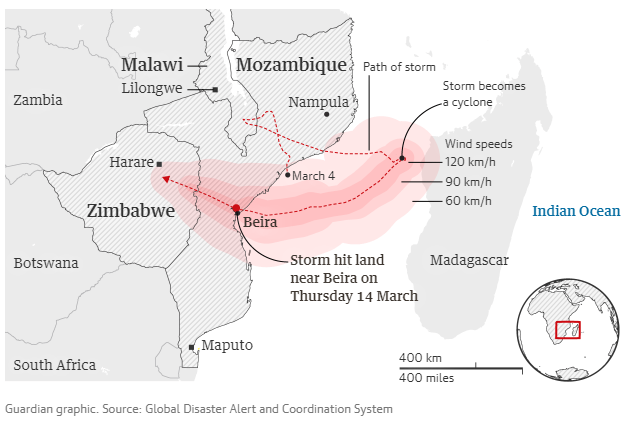 Tropical Cyclone Idai, which hit the coastline of Mozambique on March 14th has caused a heavy loss of lives and affected more than 600 000 people, according to some estimates – the number will most likely rise after on-ground assessments. Amid continuing efforts to find survivors, one of the key concerns over the coming days will be food insecurity, due damage to both crop fields and port infrastructure. Mozambique is generally a net importer of major grains, such as maize, wheat and rice. In a normal season, the country imports roughly 100 000 tonnes of maize, 700 000 tonnes of rice, and 680 000 tonnes of wheat to fulfil its domestic needs. Maize imports are largely transported on land as these are mainly from South Africa and Zambia. Meanwhile, wheat and rice imports originate from Europe, and Asia through Beira Port, which is the area that has been affected by the Cyclone. Given that domestic production of rice and wheat is relatively negligible, the devastation from the cyclone will not lead to meaningful changes in import requirements of these commodities from the aforementioned volumes. However, the challenge will be on the infrastructure side in the ports. In the case of maize, the imports will most likely increase from an average volume of 100 000 tonnes per the calendar year. At this point, I don’t know how much will be required. I will have a better sense as soon as we are aware of the scale of damage in the maize fields. This all means that there will be increased pressure in Southern Africa maize supplies this year. After all, even the key maize producing countries in the region – South Africa and Zambia – are expecting a double-digit decline in harvest in 2018/19 season. It is a tough year ahead – all due to mother nature!